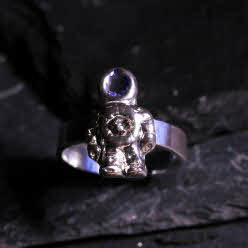 << Back Solid Silver Spaceman Ring - A NEW CLASSIC! This is new item to the webshop, but I have already been asked for the ring to be made as a special order by quite a few customers. The Spaceman Necklace has been a best seller for years now, and I have a feeling this is a classic of the future! It is crafted in solid silver - with a lovely little silver spaceman - set with a fragment of iron meteorite in his chest. His visor is set with blue enamel.